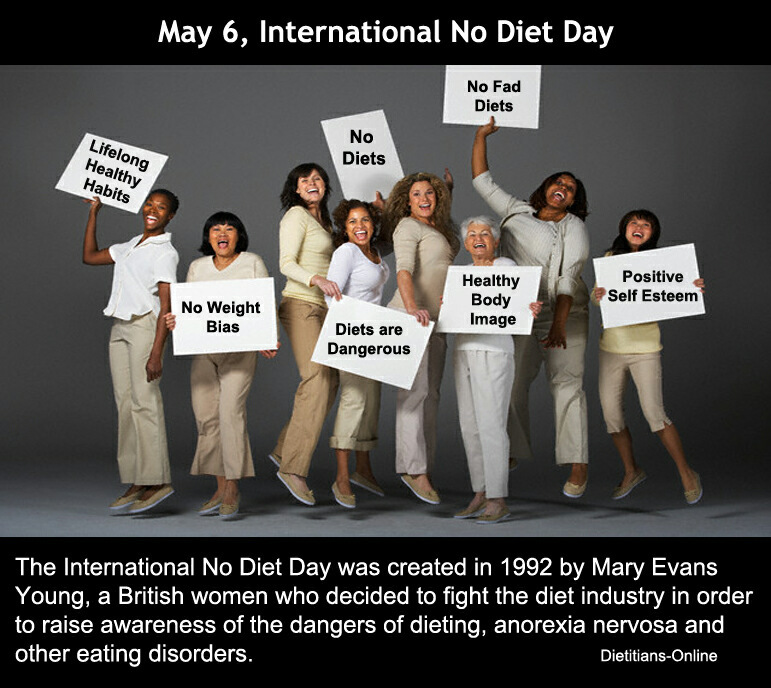 Let me invite all of you to participate in this fabulous annual celebration of body acceptance - International No Diet Day! Started in 6th of May 1992 in London by Mary Evans Young, an eating disorder victim, this is the 25th opportunity to help raise awareness and prevention to this deadly health disorder. Having this day highlights the sad fact the we are living in a weight-obsessed world where bodies are constantly subjected to judgement and criticism. Bodies today are tools to measure self worth and status, and eating is almost a religion of torment. All bodies are worthy of respect and love. You do not need to achieve a certain body shape/size to become healthy. You do not need to fast, cleanse or detox to become a healthy eater. You do not need to deprive yourself of joyful eating occasions nor do you have to punish yourself for eating "bad" foods. INDD is a day you can take a brave step forward in reclaiming your basic human right - having a body and loving it. For some, ditching weight goals and eating without rules can be challenging. Of course it's difficult - we've been raised in a weight-obsessed culture bombarded with messages stating that our bodies must be manipulated for social, cultural, and medical acceptance. So how slow or fast you want to take this journey is totally up to you. 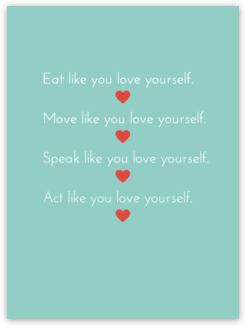 I'm just here today to give you ideas of how you can start engaging in body acceptance and joyful nourishing meals, and joyful movement so that eventually you feel comfortable in your own skin. 1. Eat what you love, with love. Intuitive and Mindful eating lays the foundation to Eating with Nourishment. It is true that the nutritional composition of food have an impact on your health. But how you approach food and eating are equally, if not more, important - both to your physical and psychological well-being. Eating intuitively and mindfully means respecting your body's hunger; listening to your body's needs; and giving yourself permission to enjoy that food you're longing for, without any guilt or shame. Intuitive and Mindful eating isn't the act of feeding yourself with forbidden foods for the sake of ditching diets, but it's about respecting your body's physical and psychological nourishment needs and staying true to providing these adequately. 2. Put on a Food-Neutral Lens. This is about viewing foods without judgement, just like we'd want to view bodies without judgement. In true nourishing eating, there is no "good" or "bad" foods. Taking such moral status out of foods can be challenging but at the same time very liberating. Know that having food rules will only put stress on your body to fuel deprivation. People come up with all sorts of rules, like "no carbs after X-o'clock", "Sunday cheat day", "low fat everything", "clean eating", and "don't eat sugar". Letting go of any rules, even just one, can start the liberation journey. There's a reason why I'm a strong advocate for dancers to take conditioning classes. It gives them an opportunity to discover their bodies' inner abilities. Tuning in to your body through conditioning, yoga, Pilates, mindful walks/runs, swimming, or any other activities you can think of, can help you build a stronger mind-body connection. 4. Appreciate your body as it is now. Your body has, and still will, go through changes. Acknowledge your body in the moment. Don't try to fight against these changes. Your body is capable of many things at each stage in the process. 5. Start creating a body positive environment around you. I genuinely believe that body positivity is infectious. By creating a body positive space for yourself, you can eventually invite others in to this space for them to start their body positive journey too! 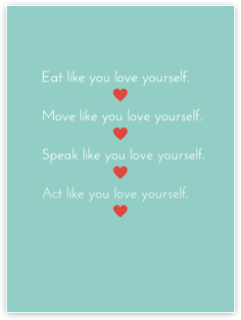 Learn about body image - Body Positive Australia and Body Image Movement are my favourites. There are kids and teens specific ones too, and of course for men as well. Get involved in body positive campaigns. BeReal (UK based) has great resources too. If you're a health professional or someone who's simply interested in the science and evidence of weight-inclusive health approach, ASDAH (Association for Size Diversity and Health) and HAES (Health at Every Size) Community are the mothers of all this with fundamental literature available. I hope from the bottom of my heart that we can all take part in being kind to, and accepting of, our own bodies we have right now.